My name is Hanako Maki and I am a Journalism major and Spanish minor in my second year at Loyola. I'm originally from Tennessee, but I've lived in Japan my whole life, so choosing to study at the Vietnam Center was the next logical step for me. I've got one eye to the horizon and the other peeking through my viewfinder, and both help guide me through my journeys. I look forward to the experiences, the food, and the photos, so stay tuned! I have successfully waited until the very last moment I could to write this final blog post. For weeks, I have been contemplating how I would face this last moment, and now that the time has come I still do not have the words to adequately express how I feel. Vietnam has been such a wonderful host; graciously she showed me her culture, fed me, challenged me, surprised me, and made me sweat beyond comfort. No experience can rival the one I have been living for the past almost 4 months. To Loyola: Thank you for providing me with such a great program, this is not an experience I would have been able to have otherwise. To Loyola Vietnam: How sad it is that we were only able to spend so much time together. Without you, I would have fallen apart this semester. To the kids: Our gang of 22 was such a mix of interesting people – it was such a pleasure to meet each and every one of you and get to know you in this bizarre, lovely country. To my roommates: It’s been a wild ride, and I’m glad to have gone through it with you by my side. Here we are, almost halfway through our biggest group excursion. Over a course of 10 days, the 22 Vietnam students will be traveling through the central and northern regions of Vietnam. As of today, we have visited the ancient capital of Vietnam, Hue, as well as the historic Hoi An. During our one-day stay in Hue, we managed to visit a number of historical sites, including the tomb of the penultimate emperor, Khai Dinh. I think it is fair to say that we’re quite the tomb-and-temple experts by now, but Emperor Khai Dinh’s tomb was still something special. Perhaps it was the surprise that awaited us inside the tomb. The exterior of his tomb is made of black concrete. The dark color, made more prominent by the rain and the gloomy skies, created an ominous air. 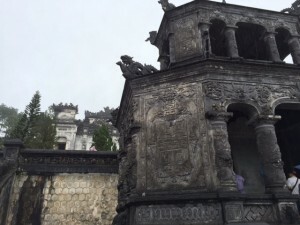 Its dark carvings and intricate towers were beautiful, but foreboding. The interior seemed like another world entirely. No more were the dark colors, instead we were surrounded by light and colors and a gleam that covered the entirety of the interior. This contrast of gothic and lavishness was not lost on me, or on anyone else. No photos could do it justice and capture the full extent of opulence. 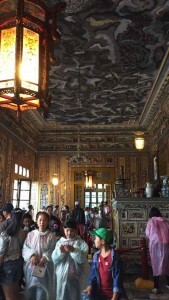 Truly, from floor to ceiling, every nook and cranny was filled with glistening jewels or perfectly painted stonework. While none of us were fans of the historical figure himself, his tomb left a very different impression on us. We were warned that Mui Ne would be a beach town for foreigners by our friends, teachers, and every review we read online. Still, when we alighted from the bus and looked around, we were still managed to be a little bewildered by the number of blonde-and-fair-skinned visitors we saw walking around. However, like almost everyone else who stopped in Mui Ne, we were there for the pristine beaches. And pristine they were. Unlike the beaches in Vung Tao, these beaches were uncluttered, unlittered, and utterly clean of garbage. Sure, the walk along the back road had its fair share of trash but as soon as we stepped onto the soft sand, we were in a different world. While the beaches were postcard-worthy, the wind discouraged us from staying too long. The coast of Mui Ne is a popular spot for wind sports; kitesurfers dominated water while the other beachgoers suffered from sand daggers. We were among those who felt the pricks of miniscule grains of sand piercing our skin, and left to head back to the hotel before the sun had set. Mui Ne offered a number of attractions in addition to its beautiful beaches. We visited both the white and red sand dunes as well as a small fishing village and Fairy Stream in one organized morning. We opted to go for a sunrise tour that began at the white sand dunes. 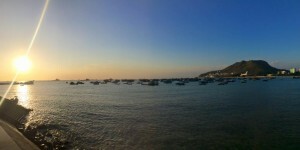 Mui Ne is the easternmost point in Vietnam, and therefore is the first part of the country to see the sunrise. Not quite the same as being the first part of the world to experience the new day, but isn’t that pretty amazing? Although our stay was short, it offered just the right amount of relaxation and calm for us all to recharge our batteries. These next two weeks will prove to be an interesting struggle – we will attempt to complete midterms while in vacation land – and the brief respite in Mui Ne before the storm was just what we needed. 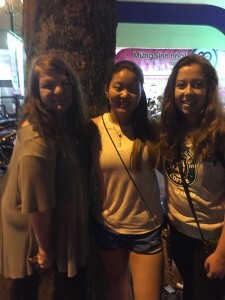 Our time in Cambodia was a whirlwind of sights, tastes, and lessons. The five-day trip was split between two prominent cities: Phnom Penh and Siem Reap, and for having such a packed schedule, everything (save for one flight delay) went incredibly smoothly. In both cities, we had tours and private buses – or in some cases, private tuk tuk squads – to take us from one site to the next. Our journey to Phnom Penh began with a pitstop in “No Man’s Land”, the stretch of land and time in between officially leaving Vietnam and entering Cambodia. Already we could feel the difference between Saigon’s more humid heat to the inner arid heat of Cambodia. Our first half-day in the capital was spent at the Tuol Sleng Genocide Museum. Tuol Sleng was first a high school, but was used as a prison during the rule of the Khmer Rouge. We were told that around 20,000 people passed through the prison, referred to as S21 (Security Office 21) by the Khmer Rouge. Heinously inhumane acts taint the grounds and the walls, as prisoners from all backgrounds were kept, tortured, and killed there. And yet, the grass was green, the sun was shining, and the birds were chirping. How disorienting it was to learn of pure violence in the midst of such tranquil scenery. This feeling continued on the next day as we visited the Killing Fields of Choeung Ek, one of the over 300 killing fields pockmarking the landscape of Cambodia. According to the audio guide, the first grave on the tour held around 450 bodies. It was the largest, but there were plenty more empty graves to suggest a much higher number. I listened to the survivors’ stories, and while they moved me to a deep sorrow, I know I could never truly understand what they went through. I hope and pray that no one else will have to ever again. The following day we departed for Siem Reap. Our itinerary in the city was comprised primarily of a tour of the temples. Beginning at Angkor Wat at sunrise, we made our way to the Bayon, and finally, Ta Prohm. 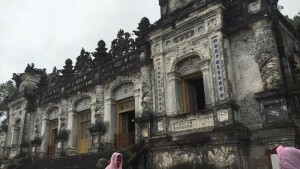 Although dated and crumbling, the temples were a stunning sight to behold. Intricate carvings adorned every wall, column, and tower. They were magnificent. No photos could do them justice (although I tried). A whirlwind it was, but Cambodia isn’t going anywhere, and in my opinion it would be well worth a second visit (or a third, or a tenth). I had the most fortunate opportunity to spend four insightful days with my partner Mai in her hometown. Kien Giang and her family of 8 siblings and 2 hard-working parents welcomed me with open arms straight to their dinner table. I arrived on Saturday evening after a smooth 8 hour ride to the southern province. The house was quiet for perhaps the first and last time of the holiday; her older brother Bay was wrapping the last of the Banh Tet with banana leaves as a nephew waited nearby, ready to cook them into the night. It was around 4 in the afternoon, which meant both of her parents were still working; her mother, feeding the pigs around the back of the house, and her father, out tending the field one last time before the rest of his children would arrive. 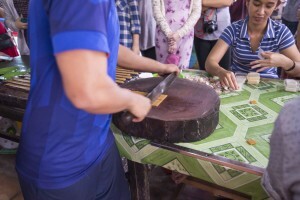 I greeted them both with the “Xin chào bác” my partner had instructed me to use. With her brothers I would use “anh”, with her sisters “chị“, with the two 16-year-old nephews “em”, and finally, with the younger children, I would use “cháu“. Of course, these are all with the proper intonation. Over the course of the afternoon and the following day, the remaining siblings arrived. I soon stopped asking which child belonged to which sister or brother; there were far too many to keep count of relations. I was put to work each day, which gave me a sense of purpose, but at the same time treated like a guest. I soon learned the meaning of the phrase “ăn đi” or “eat up” and heard the phrase “be like in your own home” multiple times. It seemed her parents’ sole concern was that I was properly fed (thankfully, there never has been a time when I wasn’t, and it shows) and treated like a guest. I also learned what it felt like to be in someone else’s home for an important family-oriented holiday. At times, I felt like an intruder. During those times I would escape out to the front porch area to write in my journal and soak up the calm Mekong air. Other times, I would simply sit and witness an exchange of words still so foreign to me, met with a sharp retort or unbridled laughter. Here was a family who loved each member dearly, and through the trials and tribulations life may have thrown at them, they made it through each one with the assurance that family would always be there for them. It was a beautiful sight to see that made my own heart ache for the same warmth I find in my own family, but at the same time feeling blessed (yes, I said it, #blessed) to be able to be part of such a wonderful family if only for a brief time. Thank you Kien Giang, thank you Mai, and thank you to your family. I will never forget them. The troop successfully embarked on its first program trip this past weekend. We ventured into the Mekong River Delta, one of Vietnam’s two prominent river deltas. The Mekong is a fluid source of power and economy to the people of the southern region which we were able to witness during our trip. 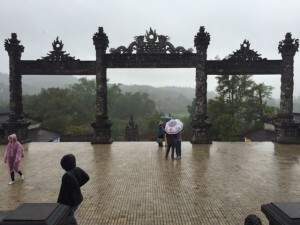 Our cultural tour began at a Cao Dai temple. Caodaiism incorporates practices and beliefs from Taosim, Buddhism, and Christianity, to name a few. Soon after leaving the temple, we arrived at our boat. Our tour guide was a wealth of knowledge, which he gladly shared with us all, teaching us the history and culture of the region. Our first stop along the river was at a river market, and what seemed to be a hub for tourists. We were able to see how coconut was used to make a variety of snacks. My favorite? Coconut taffy, specifically, freshly made coconut taffy. While the other, more adventurous students and friends on our trip tried snake wine, I stuck to the safer option of coconut taffy and pop rice, the Asian counterpart to popcorn. I did, however, hold a 25 kg python, a feat I am quite proud of accomplishing (never mind the snake was probably used to it). And speaking of snakes, they are quite the delicacy in the Mekong Delta region, so of course we had to try some. Shocked and awed, I couldn’t tear my eyes away as our tour guide killed the snakes and cleaned them to be prepared for dinner. The snake, wrapped in bitter banana leaves, was palatable and somewhat akin to the texture of a meatball, but I don’t think it is a dish I’ll be adding to my Top 10 list (although most of the positions are held by other Vietnamese dishes). 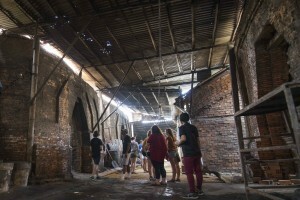 The next day our tour guide took us to a brick factory, which relies heavily on the Mekong Delta. The bricks are made up of a mixture of sand from the Mekong and clay, and the kilns are fired with rice husks transported along the river. This factory also exports pots, vases, and scaled-down replicas of the Easter Island statues, as well as provides impish students with a playroom, aka the storeroom for hundreds of millions of rice husks. 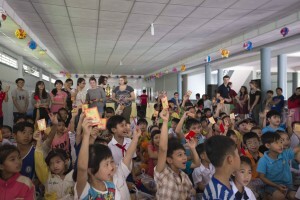 On the way back to Saigon, we stopped by a pagoda to visit and play with some 100 children. Prizes were distributed for games such as the potato sack race, gifts were given to each and every child in preparation for the new school term, and we also had the opportunity to hand out red envelopes containing “lucky money”. During the Tet holiday, children receive money from older relatives which they refer to as lucky money. All in all, it was one sweaty, jam-packed, educational, entertaining weekend. After completing our first full week of classes in Sai Gon, we decided to treat ourselves with a getaway. Almost all 22 of us piled onto a Futa Bus, where the seats were as small or smaller than those in economy class. 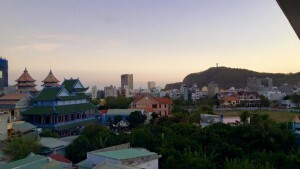 Two hours later, we had arrived in the relatively quiet beach town of Vung Tau. We had been warned that it wasn’t the most picturesque beach in Vietnam, and while that was true, it served as the perfect day trip destination. The beach itself was a narrow strip that stretched as far as the eye could see, and featured plenty of open-air restaurants and bars. We found a cozy spot next to one such place, so we didn’t need to wander far for lunch. Some of us immediately lay out and basked in the sun and enjoyed the breeze that kept the air from become stifling hot. The rest hit the waves. The dry season in Vung Tau is known to have high winds and big waves with strong undercurrents in some spots. Evidently we had chosen the perfect spot: while the waves and current were stronger than what I am used to, not once did I feel anything more than exhilarated at being in the waves. Of course, being the adventurous lot that we are, we didn’t want to restrict ourselves to just the beach, and so we set off for the lighthouse. We all know what lighthouses look like, so the structure itself was nothing too impressive, aside from the fact that it was built in the 1930s and looked great for its age. But my oh my, the view was something entirely different. The old lighthouse sits atop a hill, prime location for a 360 degree view of the city (Check my photos out above). We stopped here to simply soak in the spectacular view of Vung Tau and its houses, buildings, beaches, open waters, and hills. The view from the bottom of the hill was just as stunning. We arrived at the bottom right at the beginning of “golden hour” A.K.A. my favorite time of day. Everything was bathed in a magical golden glow, and served as the perfect ending to our little adventure. 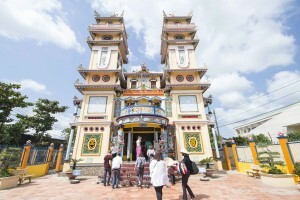 Before leaving Vung Tau, we also managed to visit a temple and eat at one of our Vietnamese partner’s family restaurant. All in all, it was a day well spent. Do not underestimate the strength of the sun, especially when near the Equator like in Vietnam. Not getting the perfect tan is a sin I’m willing to make in exchange for not burning and peeling. Sunscreen is essential.